I have been using the ‘Vanilla & Mango’ range of beard care products that Mo Bro’s Grooming sent me as part of the XL tin for review, like the balm the Mo Bro’s Grooming ‘Vanilla & Mango’ Beard Oil is a massive fruity burst and leaves your beard smelling amazing and looking good. I have been using the 10ml oil which contains Sweet Almond and Grapeseed carrier oils for the base but the Mo Bro’s larger sized oils which is their Premium oil comes in 50 and 100ml and has a base of Sweet almond, Grapeseed, Argan and Jojoba carrier oils. The 10 ml oil is a nice oil that will help keep your beard soft and prevent the dreaded beard itch but as it only contains the two carrier oils and doesn’t contain Argan Oil, it was able to fully control my wirey and wayward beard, however their Premium oil would likely be up for the job. 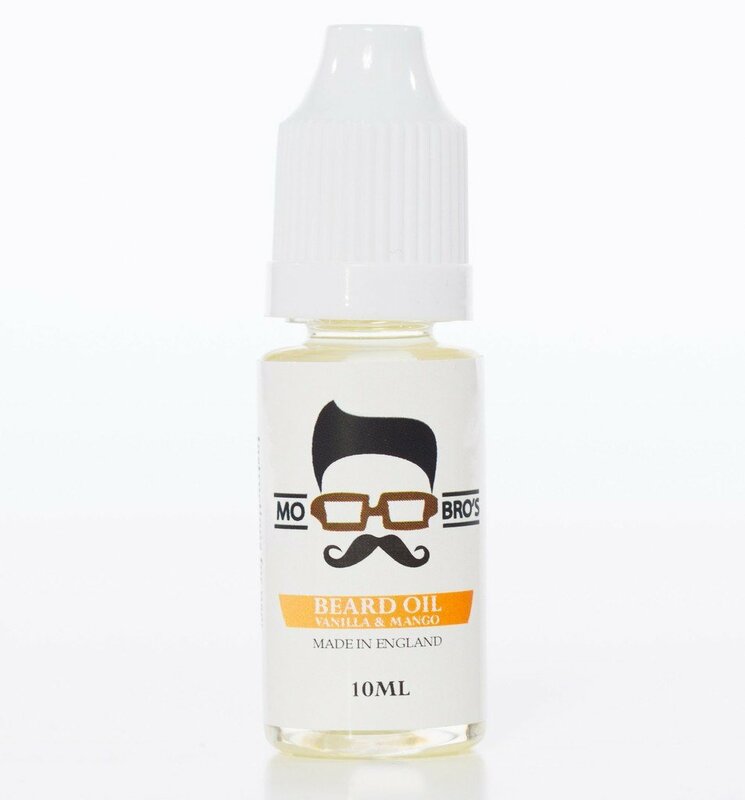 Mo Bro’s premium oil is available in 50ml for £9.99 or £8.99 on subscription and 100ml for £14.99 or £13.49 on subscription but currently is limited to Vanilla and Mango, Cedarwood and Unscented. I have enjoyed using the ‘Vanilla & Mango’ beard care products that came in the XL tin, I received the Oil, Balm, Wax, Soap, a wooden beard comb and a pair of scissors and this is the perfect kit to help keep a beard in great condition, although my advice is to hide the scissors as it’s all to easy to get tempted to have a little trim and ruin all the time you have put into growing that beard. Mo Bro’s have an incredible range of grooming products on the website and their customer service is truly first class, Lewis pictured above is usually available on Live chat and if not he will get back to you ASAP if you leave a message. Mo Bro’s range of products is constantly growing and they are a company that you can trust, I think their Premium oil range will be worth buying as it has a better base of carrier oils and as they bring out more scents in the range it will prove to be a winner. Thank you to Lewis who sent me the kit to review and he has been very helpful and answered the various questions that I had, now it’s time to put the Mo Bro’s away and move on to the next test and review. I currently have a large queue of products to test and that means that I can’t use a product longer than the 3 days, its a shame as I would have liked to have used the ‘Vanilla & Mango’ Balm for a bit longer.